In theory, all these posts should be about clothing, and yet, there are certain times when there has been a meal, or party, or some other event or gathering that I know my mother would have loved, that has made it's way into these posts. And today, it is falling leaves, in particular, Ginkgo Leaves. The Ginkgo tree was my Grandmother's favorite. One year, after I had just moved back to New York City from Portland Oregon, I cooked a Thanksgiving meal for just my grandmother and me in my tiny galley kitchen. My roommate was with her family, and my mother and stepfather were in Florida. My Grandfather had passed away several years earlier, so it was just us two. In her place setting I tucked a sprig of fallen Ginkgo leaves that I had found on the sidewalk. I knew my Grandmother was touched, and that my mother was proud of me for putting this meal together. A young girl in her early twenties, choosing to spend thanksgiving alone with her Grandmother. My girls will never be able to do that for my mom, but I hope that I am raising them to be sweet, conscientious, and inclusive young women. My mother's relationship with my Grandmother was complicated, (what mother daughter relationship isn't?!) But the nice thing about Grandmothers? All of the love, none of the discipline! I really loved my grandmother, she was an elegant, larger than life woman, with a boisterous laugh, and the ability to talk to ANYONE- (I swear, she tried to set me up with every cute waiter she met!) This week, I had the lovely occasion to go to tea at the Huntington Library, with my mother-in-law, my husband, and my daughters. The last time I had tea there I was with my mother. After tea, we meandered through the grounds, landed in the Japanese Garden, and stopped to touch the suiseki or viewing stones. Viewing Stones can evoke a variety of responses and most of the stones on display there are considered beautiful because of their unusual shape, color and smoothness. Visitors are encouraged to touch and even rub their hands against the stones to keep them polished. The guide also suggested that you make wishes, "These stones are powerful, and are very good for wishing on." And so I did. I wished on all seven of those stones. I wished for all of the things one would imagine. I thought deeply of my mother. And then I looked down at the ground, and saw the fallen Ginkgo leaves, and thought of my grandmother, and that thanksgiving all those years ago. I do happen to believe in miracles, coincidences, kismet, whatever you want to call it, but that day and those leaves, that was a hello from my grandmother, and I thought "Gram, if your there, mom must be too. She just has to be." And so that's what I will take with me as I head into the Holidays. My mom is not here, but she is all around me. "in·her·it : receive or be left with (a situation, object, etc.) from a predecessor or former owner"
That is a pretty spot on definition, and when I inherited the contents of my mothers closets, it was not only her clothing, but also the clothing of my grandmother, great grandmother, and great aunt. My mother was not just the only one that the clothes fit, but also the one that loved these clothes more than anyone in the family, and so over the years, as the inheritance made it's way through the generations, my mother's closet became the final receptacle. The closets have an almost archaeological element to them, with clothing organized by era, and style (evening gowns, furs, day dresses) I am always so happy when I can find a picture to post of my mom wearing an item I have inherited, but this particular item has an even more interesting picture; The photo I am holding is of a pastel portrait of my great Aunt Margery (who was the original owner of this blouse) made by my uncle Herbert. Sadly, The pastel has been lost, but the photo of it still remains. So now in a truly meta moment, I present a photo of an inherited blouse, while holding a photo of a portrait of an ancestor wearing said blouse, wait...am I going to open up a hole in the time-space continuum? I mean come on......It's a full length, black silk, hand beaded, opera coat. That's just cuckoo bird! And let's just have a chat about that collar, oh and the inverted back pleat and the BEADING!!!! This is truly a work of art, and I cannot believe the craftsmanship that went into this piece. If you stop to think about it, the lion's share of the beading and detail is actually on the back of the coat, how interesting, it's the fashion version of "burying the lead" Also did I mention that it weighs a ton? If you have any vampire friends that might need a cloak for a red carpet event, please feel free to send them my way. Ah-truer words were never spoken. But then in a miracle moment, it actually did rain on Halloween night! Frankly, I would break this out even for cloudy skies with ZERO chance of precipitation. This is one of the pieces that I don't have to think twice about keeping. It is a classic to be sure, and one that I look forward to wearing for years to come. Now bring on the rain!!!!! Ok - so the time has finally come for the big kitchen reveal! I wanted to wait to post it until I could have it photographed properly. (Thank you Amy Bartlam of Click Creative!!!!) I've been thinking recently about the old kitchen, while it was SUPER inefficient (dead corners, crumbling black grout on the counters, base cabinets whose main job was to ensure that each time I took out a platter, it would chip on the way out....you get the picture) I made a lot a great meals in that kitchen, and will always have fond memories of the years I spent cooking in it, but now let's talk turkey, pun intended - I LOVE my new kitchen. I love each time I 'soft close' a drawer, or pull a tray out of it's own slot, or put the coffee maker away in the appliance garage. Ah, a place for everything, and everything in it's place. That is the OCD in me in full effect. Now if I can just organize the crawl space!!!!!!!! Nah, that's not gonna happen anytime soon...or is it? Below are a few pictures of the new kitchen, but if you do get a moment to check it out on my website, there are more. "Powder and Paint make ya' what ya aint'"
As you can see from the photo above, my mother had an extensive collection of makeup. Amazing, high-end makeup, Laura Mercier, Armani, Francois Nars, Bobbi Brown, Chanel, makeup that I have not been able to part with. 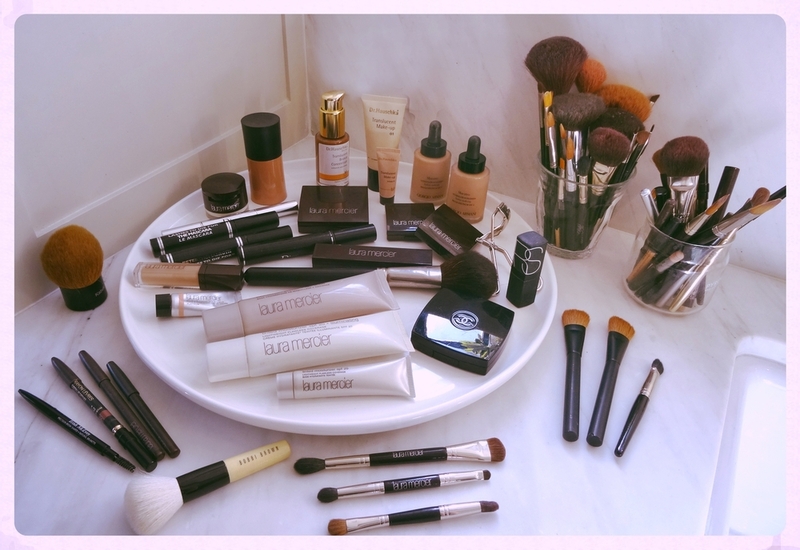 In an earlier post, I touched upon what a sweet time it was, just us girls, perusing a makeup counter together, looking for a new concealer, or that amazing lipstick that would change our faces, and how much I missed that time. I still miss that time, I will always miss that time. But recently, I have been thinking about what makeup meant to my mom as she became progressively more ill. It was the promise of a flush in her cheeks stolen by chemotherapy, or replacing moisture on her face after a physically exhausting day spent traveling from hospital to Dr's office in Manhattan's harsh midwinter. I will never forget the day my mother told me she had cancer. It was August 2011, I was driving home from a yoga class, (I always tried to cram those classes in pre-beach beach time in NY) She tried to be nonchalant, telling me that a previously benign spot on her lung, had been diagnosed as cancer. She quickly went on to add that they were going to do a series of chemical treatments, and then she would move on to maintaining the cancer with chemotherapy in pill form. I am not sure, and will I never know, if this was a story of hope constructed for her or for me. She was the most afraid, I found out later on, that she was going to have to lose her hair in front of me. For all of the years we had a topsy-turvy parenting structure now my mom was trying desperately to protect me. As anyone can see from her pictures, she was a beautiful woman, and I think losing her hair was a terrible blow. My mom was old school, she had her hair done professionally, whenever she could, and it was amazing. She rocked a Jackie O flip, in and out of it's era's of coolness. My mother went to the same salon near our home in Long Island for nearly 15 years. Keeping the same hairdresser for close to 10 years. This hairdresser gave my youngest daughter her very first haircut. This salon was known not only known for it's hairstyling, but also it's amazing hairpieces and wigs. The salon's wigs could veer into the thousands of dollars. So when my mother asked as a long time customer, if there was any way they could help her with a wig due to the cancer, they said matter a factly- no. "Our wigs are sought-after all over the world, and are of the highest quality, that is why they are so expensive". Let's be totally clear, my mother was not asking for a free wig, she was asking for a slight discount, on account of the 15 years of patronage, oh, and the cancer diagnosis, you horrible, horrible garbage heaps of humanity, My mother never went back. I don't blame her, and boy do I wish I could have given them an earful. I was with my mother when she got the prescription for her wig (who knew that was prescribable?) and went with her to Barry Hendrickson's 'Bitz-n-pieces" in New York City. It is an unfortunate name I know, but she was treated with dignity there, and made to feel beautiful. The Stylist that worked with her was jovially flamboyant, and sensed my mothers trepidation, about the upcoming haircut (head shave, let's be honest) and told her how lucky she was to have such a great shaped head (actually she did). Proclaiming "honey, powder and paint make ya' what ya aint' your gonna look gorgeous!" Together we picked out a chic, 'Jennifer Aniston-esque' chestnut bob. My mother looked good in it, but from the moment she put it on I could tell she hated it. When I look back at pictures from that day, I can see the sadness in her face. Who can blame her? My mother lived year round in warm weather climates, and no matter how much sticky tape you used, it must have felt uncomfortable and unstable. Hell, I lose my mind after about 20 minutes of wig wearing on Halloween! That's why I think we were all so excited when my mothers hair began to grow back in. It was not just about comfort, it was about hope. A sense of excitement that growth and life were coming back to my mom. We all loved how my mom looked with her new short hair, even my mom. She really did look great, rocking a salt and pepper pixie cut. There were only about six months when she was really sporting her short hair, but those images of her are some of my most vivid. Mom-you were always a great beauty, because your beauty came from within. It was a radiating, palpable thing. It was not going to be stripped away from you when you lost your hair. It has not been stripped away even in your absence. It is carried on every day in every memory I have of you. I have written a lot about my mothers killer fashion sense this past year, and at times spoken about her cooking, but I don't believe that I have ever showcased her talents as an incredible pastry chef. Being a good cook is a skill, being a pastry chef is an art. As you can see from the cakes above, she was a true artist. She would think nothing of hand crafting several hundred sugar paste petals and leaves for a wedding cake, and could mold marzipan into every imaginable shape and likeness. To master pastry, you also need patience and I believe, a sense for it. It used to drive me crazy when I would ask her for exact timing on certain recipes, like her caramel for instance, to which she would respond "Oh honey, just take it off the heat when it looks right"
This past weekend was the big fall fundraiser for my daughter's school. At the event they have something called a "cake walk" basically like a big game of musical chairs, where if you land on the number picked at random, you can win a cake. I have enjoyed baking some fun Halloween themed cakes for this. I have two pictures below, one I made while my mom was alive, and one I made for this year. My mom LOVED seeing pictures of the cakes I made, and always loved talking food with me. She only got to see one of these, but I think she would have been proud about this years effort. They seem sort of amateurish compared to what my mom could do, but they are fun, and were made with love. Here is to sweet memories of sweet things. This post is about a very simple and beautiful necklace from my mother. Instead of being passed on, this was a gift from her. My mother was never terribly religious, but was deeply spiritual, a trait that she most certainly passed on to me. Let me set the stage. My Grandfather, Herman Paul Tasman, (H.P. to his friends, Herm, to my grandmother) was a luminary in his field, simultaneously a pioneer in the field of modern linguistics and computer technology. My grandfather spent most of his adult life in the employ of the IBM corporation. During that time, he was assigned to two major projects that not only shaped his life, but also helped facilitate the way ancient texts could be interpreted, and digitally archived for future generations of scholars and students. My grandfather was integral in indexing the Dead Sea Scrolls, and also spent nearly 30 years helping to prepare a computerized index of the writings of St. Thomas Aquinas. My grandfather was assigned by IBM to work with the Rev. Roberto Busa, a Jesuit priest, on the Aquinas book, a joint effort of an Italian financial committee and the Roman Catholic Church. He and Father Busa compiled the 50-volume Index Thomisticus, a comprehensive concordance of the 13th-century philosopher's writings. The job involved indexing more than 12 million words, 16 times longer than there are in the Bible. It took about 10,000 computer hours and 1 million human hours to finish.and my grandfather retired from IBM in 1969, the year the work was completed. With all that, I truly believe that my grandfather was more scientific than religious, and so my mother was raised with a religious void, but a spiritual heart. 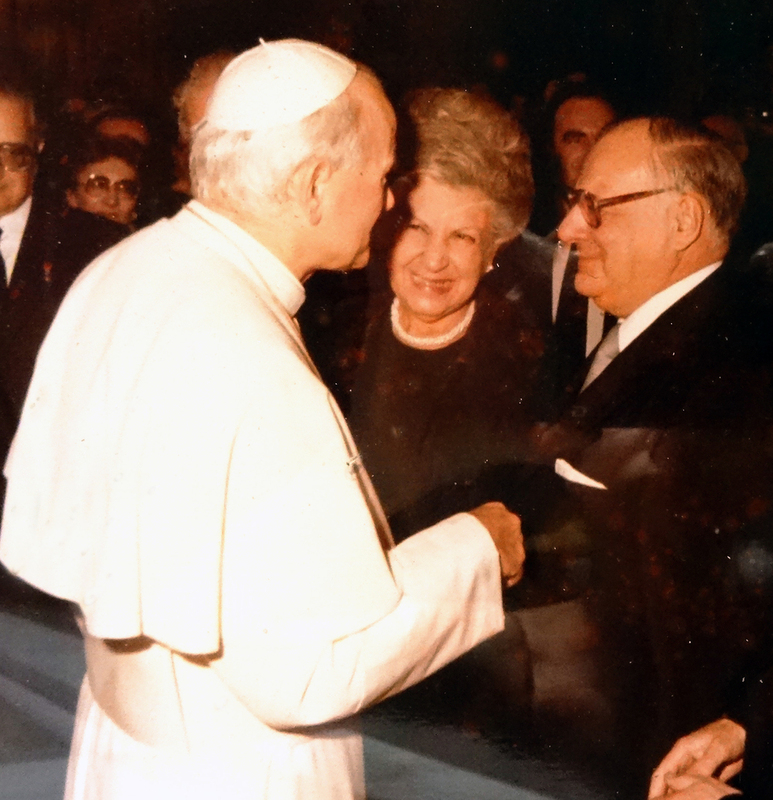 Padre Busa, became one of my grandfather's best friends, and truly a part of my family. After my mother passed away, I found letters from him in response to my mother asking for advice (on what I will not say, because, I do not believe that she would have wanted to share) He wrote to her in the most understanding and compassionate way, like a caring parent would. In the 1980's my grandfather was called to the vatican (circa John Paul II) to receive an award which is called the 'Commedatore' (Literally Knight Commander, the official title of Commendatore is awarded by decree of the President of Italy to individuals who are given this honor in the Italian Order of Merit known as the Ordine al Merito della Repubblica and other orders of knighthood. The Commendatore (or Knight Commander) rank is a higher award than that of "Ufficiale" (Officer), which in turn is higher than the first level of "Cavaliere" in this order of chivalry which was originally established in Italy by the Royal House of Savoy." I am not really sure how my mom and Mike got an audience with Pope Benedict, (and to be honest, he was not my favorite ) But they did. And when they were at the Vatican, my mom got me this beautiful pendent. As I mentioned earlier, my mom was more spiritual then religious, and so I believe that the Mary pendent was purely about mother and child. I know that Mary was always my mom's favorite Icon, and that she probably got this for me with that in mind. Many years ago, when my oldest daughter was still in a crib, she was very ill, and I was scared. In a moment of prayer, I pulled out the pendant and hung it on the rail of her crib. A symbol of a mother watching over her child. And then it disappeared, Years passed, and I did not find it. And then one day, as I was cleaning my daughters' room to make way for her big girl bed, there it was on the floor. A reminder that my mother was still watching over me. Mom, I feel you in those moments, and in every moment. Thank you for still being there for me in so many ways. Thanks for still watching over me. I could not talk about my mother without talking about her love of miniatures. In addition to being an amazing chef, my mother was an incredible miniaturist, she made the most incredible room boxes, and miniatures. There will be pictures of those in future posts for sure. This is the dollhouse my mother gave me when I was 8 years old. I was instantly hooked. I have never been able to, nor have I wanted to, let go of this dollhouse. Over the years, I have done sporadic work on it, it is actually painted the same color as the exterior of our house in Long Island, and I attempted to shingle the roof. It has found a new lease in life with my daughters. Nothing makes me happier than to see them play with it, and I know my mother loved that as well. In addition to her clothing, I have also inherited her vast miniature collection. Now that, I truly have no idea what to do with, but again, can't just throw out. While my girls are still young, I parse out the things I think they will enjoy. It's a sweet hobby really, I think there is such magic in those tiny little works of art. This is a pair of Seaman Schepps shell earrings. They were a gift to my mother from her incredibly generous and close friend Sarah. She gave them to my mother as a thank you for helping her find her summer house. I am sure my mother's motives were twofold, she wanted to help Sarah find a place, but it was a bonus that it was walking distance from my mothers house.! After my mother passed away, Sarah asked me about the earrings, I could not find them anywhere. Both of us were convinced that they were lost somewhere in the shuffle. 6 Months later, I was back in NY and I found them. Below is the text conversation I had with Sarah after I found them. "An immigrant’s son, who grew up in the tenements of New York’s Lower East Side, Seaman Schepps rose to prominence in the 1930s with jewelry designs that challenged the status quo and defined a new style for the American woman. With his chunky brooches, “barbaric” bracelets and “bubble” earrings, Schepps pioneered a unique style of jewelry whose sense of splendor offered a new perspective to the world of fine jewelry. This is such a sweet dress, and by the size and tone, I believe it was made for my mom by her mother, on one of her trips to Asia. I truly love to dress my daughters, and wish they would still let me do it! But alas, there are no Peter Pan collars in their rotation, nor are there even any dresses. My girls are all about jean shorts, leggings and t-shirts. Oh well, who can blame them? Those are the most comfortable ensembles on the play yard. Maybe one day this will be their jam. Until then, I will be the custodian. Oh my, what a sweet, silly dress. Really, I believe this is a dress for pure fun. If there is one thing my mother loved it was entertaining and performance. This dress would have struck all the right cords with her. (no pun intended!) It is silly, and yet surprisingly elegant at the same time. My mother always knew how to dress for the occasion. That is a skill I am trying to pick up from her. I felt compelled to post this coat after my weekend in Portland, which is notoriously known for it's political correctness. The furs I have inherited are beautiful, and yet sadly, deteriorating at an alarming rate. The coat I am wearing in this photo is a vintage lynx coat from the house of Revillion. As a little girl, the Revillion department of Saks was my favorite destination. I used to love to burrow under the racks of furs, and if it was quiet, try on and "model" the coats. I so wish I still remembered the name of the Revillion deprtmtent manager, because he was so kind to me, and a dear friend of my parents. Fur is not PC, I totally get that, but does that apply to the old stuff? Before we were collectively, con fur? Is there any grandfather clause for folks that inherited these pieces VS buying them new? Another note about this post, as much as I love this coat, there is for sure a touch of "Grey Gardens" in the ensemble. Some funny disconnect, wearing a couture fur over a nightgown. I would be doing a disservice to this blog if I did not tell the following story, and yet it is hard for me to do so. When I was 7 or 8 years old (at the max) I watched my mother walk out of our house after a fight with my father, but what made it unique was that there was a foot and a half of snow on the ground, she was barefoot, and wearing a fur coat over her nightgown. She ended up few days later at an airport. Mom, I imagine that you would be furious at me for writing about this, but I hope you understand that I need to tell our story, and while there are difficult moments, addressing them is where the healing begins. Revillon Frères (Revillon Brothers) was a French fur and luxury goods company, founded in Paris in 1723. Then called la Maison Givelet, it was purchased by Louis-Victor Revillon in 1839 and soon, as Revillon Frères, became the largest fur company in France. Branches were opened in London in 1869 and in New York in 1878. At the end of the 19th century, Revillon had stores in Paris, London, New York, and Montreal. Through its fur buying bureau in Leipzig, Germany (1876), and an agency in Moscow (1905), the company bought most its furs from the markets of Moscow, Leipzig and at the annual fairs in Nizhny Novgorod (Gorki) at the Makaryev Fair and in Irbit at the Irbit Fair. From 1908-1909 Revillon Frères opened fur trading posts in Siberia, Mongolia and Turkestan. By 1912 Revillon Frères had 125 fur trading posts in America and Siberia. In the 1960s, Revillon acquired Grauer Furs, New York's preeminent fur manufacturing company. Grauer Furs was founded by Austrianimmigrant William Grauer and later operated by Grauer's two sons, Abraham and Herman. In 1970, in a deal negotiated by Herman Grauer, Revillon became the fur supplier to Saks 5th Avenue. This arrangement lasted until 1995. I truly love these photos. I never planned to post these side by side, but as I was looking for an example of my mom wearing one of her great sleepwear pieces, I found this photo of my mom in the hospital with me as a newborn, and I was stunned by our expressions, they are almost identical. In the picture on the left, I am with my youngest daughter, and she is actually the one wearing one of my moms pieces, a vintage peignoir, that I know was one of the pieces in my mother's rotation while in the hospital after I was born. I remember an article I once read that talked about the way a mother looks at her children. It likened it to the way a person gazes on someone they are deeply in love with. That has always stuck with me, because each time I look at my daughters, I feel such an intense love. In this picture of my mother, I can see the love in her eyes. I have said this before, but even with all the struggles we went through early on in my life, I always knew I was loved. I hope my girls will always feel that same way. Oh, Gay Boyer. Gay Boyer is not only a talented designer but was also a family friend, with an eponymous collection of jewelry, clothing and accessories. Her collections erred on the conservative, yet glamorous side, and my mother was a huge fan. She most have owned close to 100 of her pieces. After my hippie freakout "gap year" my mother welcomed me back home with open arms and helped me secure a day job at Gay's studio in Manhattan. I went from Birkenstocks to Ferragamos, and tie dye to plaid, and guess what? It was awesome. It was really fun to re-invent myself. Gay was so kind to give me a chance, and I really enjoyed dressing up and going into the city everyday. That being said, when my time came to take advantage of my deferred college enrollment I was ready to fly. Many, many years passed before I was engaged, but as her only daughter, my mother was over the moon with the idea of dressing up (and dressing me up) for engagement parties, showers, and ultimately my wedding. At the time Gay was making a line of semi-precious stone and pearl jewelry, and my mother bedecked me in all manner of it. This natural pearl twist necklace is simple and elegant, and can be worn with many outfits. What can I say, I am a sucker for pearls, and believe they are terribly underated. I think Gay may have sold the company, because when I google it now, it comes up as 'Boyer New York.' While perusing the current website, I found that the pieces are being sold at two places that have special meaning to me (and did to my mom) The Village at Cross keys In Baltimore, (where we used to pal around together in our free time before moving to NY), and Mildred Hoit In Palm beach, where we spent every year visiting my grandparents, before they become too ill to make their annual trip. As a woman business owner myself, I now see Gay in an entirely new light. How cool was it that she had a showroom on 7th avenue, and was a business owner/wife/mother in the 70's and 80's?